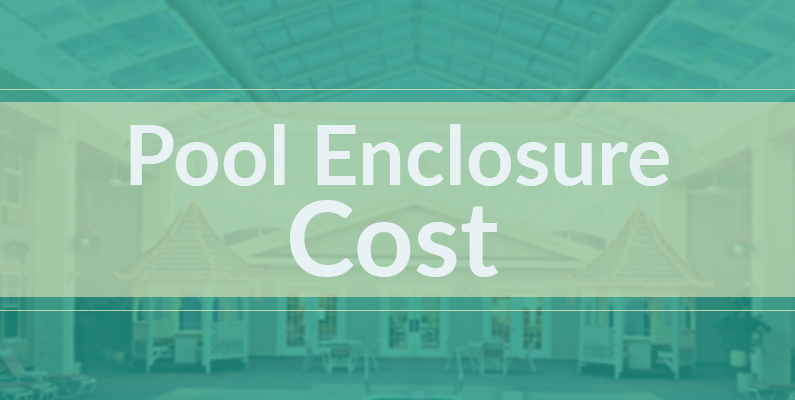 Pool Enclosure Cost | An Enclosure is Less Expensive Than You Think! Pool Enclosure Cost | An Enclosure is Less Expensive Than You Think! Pool Enclosure Cost — It’s Less Expensive Than You Think! A pool enclosure is one of the finest home improvement investments you can make during your occupancy of a residential property. Whether it’s built as an addition to your home or a standalone structure, an enclosure will protect the pool area and add to the value of your property. So how much is a pool enclosure? That can all depend on a variety of factors, such as the size, design and materials used. Additionally, the location of your property and your intended uses of the pool can further impact the overall price as you come to your decision on an enclosure. Pool enclosure prices can range from moderate to high, depending on your needs in the following areas. High enclosure. Designed to turn your pool area into an outdoor, sunlit room, high enclosures are standing–room high and offer plenty of space for people to walk, sit, recline and swim. Medium enclosure. Designed to give people plenty of space to move around above the water level — but without obstructing the view of your fence, lawn or garden from the back windows of your house — a medium enclosure reaches several feet above the ground. Low enclosure. Made primarily to seal off water from rainfall and debris, a low enclosure allows enough room to swim and only goes as high as two feet off the ground. Is your pool large or small? How many people use the pool? Would this structure be attached to your house? The overall size of your pool can be used to determine the necessary parameter for an enclosure. Is your pool small and round, or is it long and rectangular? The number of people who use the pool, and the events in which the pool is used, can also determine the necessary width of an enclosure. Do you want this structure to house just the pool itself, or do you also want space for lawn chairs, plants and a drink stand? Will this pool be used by just two or three people, or do you intend to host parties and neighborhood get–togethers with the pool as the main attraction? The placement of the pool in relation to your house could determine whether the enclosure would serve as a three–wall extension to the house itself or as an independent structure. Is the pool just outside your backdoor, or is there at least 10 feet of distance between the two? If the pool is situated at a considerable distance, but you still want the enclosure attached to your house, you’ll likely need an enclosure with long walls. The suitability of one enclosure type over another can be somewhat determined by the region in which you live. If your home is situated in a region that sees little rain throughout the year, you might be content with a screen enclosure to protect against bugs and blowing debris. If your home is located in an area that typically endures harsh rain or snow during fall and winter, a glass enclosure will allow comfortable use of the pool throughout those rainy months. In hot and cold weather, a glass enclosure allows you to adjust the temperature to your liking because, unlike screens, glass can accommodate an HVAC system. Standard. This would be your basic three or four–wall, screen or glass enclosure. Retractable. A retractable enclosure can be folded up when you wish to view your lawn or garden. Custom. Just as the name sounds, a custom pool enclosure can be designed in any way that you could imagine. 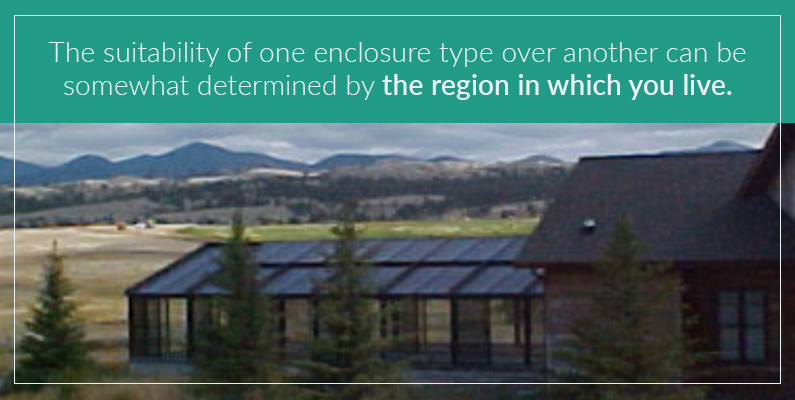 A custom design could range from conventional and flat–roofed to exotic and dome–like. While the design of choice could largely rest on your personal aesthetic preferences, things to consider alongside taste include the overall design of your house and the potential resale value. If you fancy one design, imagine how it would look as an addition to your house — would house and enclosure be complementary? If you sell your home within the next decade, would the style of enclosure appeal to potential buyers? Lifestyle needs should also be taken into account as you consider one enclosure design over another. Will your pool be used throughout the year or only during spring and summer months? If you use the pool year-round, a solid enclosure — standard or custom — is likely the best option. If you only use the pool five months out of each year, a solid enclosure could be ideal as a safeguard against rain and debris. Then again, if you like to see other parts of your yard, a retractable enclosure and plastic sheet cover might be more convenient during months when the pool is not in use, especially if your property is small. Even if you use the pool regularly throughout most months, you might be more inclined to open and close a retractable enclosure on a regular basis. Glass. Clear and solid, glass enclosures protect pool areas from debris, bugs and UV rays. Polycarbonate. Less expensive and lighter than glass, polycarbonate provides solid but clear protection. Vinyl. Even lighter than polycarbonate, transparent vinyl offers tent–like protection from the elements. Screen. Useful for blocking debris and bugs, screens are a practical choice in moderate climates. However, screens don’t offer rain cover or UV protection. Do you want a standard or retractable pool enclosure? What is the climate in your area? Which material suits your house from an aesthetic view? Glass or screen enclosure bodies are generally the most suitable choices for homeowners who opt for a standard enclosure. Vinyl is often favored for retractable enclosures due to the material’s lightweight. Anything solid is preferable in regions where weather conditions range from rainy to humid. 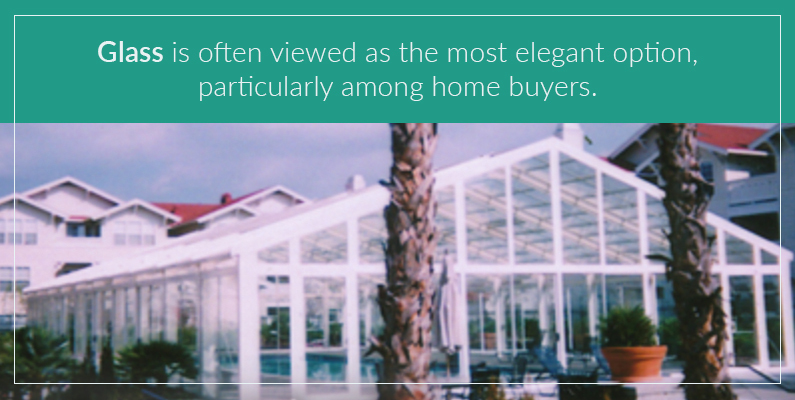 In terms of aesthetics, glass is often viewed as the most elegant option, particularly among home buyers. As with any home–improvement undertaking, the addition of a pool enclosure is a major investment. As you make choices on the size, design and material of an enclosure, consider the labor costs that a given project might involve. Granted, labor is only part of the overall cost, as the price of the enclosure itself is another matter entirely. With most installations, labor is charged by the hour, just as the panels of an enclosure are priced on a per–foot basis. Special lighting. If you wish to use the pool in the night as well as during daytimes, you’ll want the enclosure to be capable of supporting light fixtures. HVAC capabilities. If the temperatures in your area ranges from scorching in July to freezing in January, you’ll need an enclosure that’s capable of insulating your pool area. Even if you live in a more moderate climate, heating and cooling capabilities can greatly improve the comfort of the pool experience. Electrical wiring. To support features such as lighting and HVAC units, an enclosure must have access to electrical power. If the enclosure is separate from the house, electrical access will need to be incorporated within the structure. 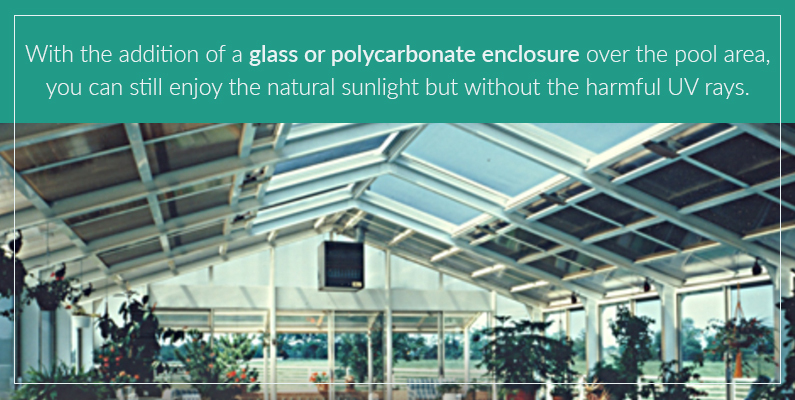 Overall, solid materials like glass are the best for protection against climate. Design–wise, enclosures that attach to houses can more easily accommodate features such as light and HVAC systems. A pool enclosure is a sizable investment that pays itself back in numerous ways over the long run. Over time, an enclosure can save you money on heating, insurance premiums and treatment chemicals. Moreover, an enclosure adds to the security and aesthetic appeal of your property. Overall, the cost of a pool enclosure is well–worth the numerous benefits. A well–designed, complementary pool enclosure can enhance the aesthetic appeal of your property. Guests to your home will appreciate its beauty, and household members may find a newfound sense of excitement over the house, just like the day they first moved in. If you place the house on the market at some point, the pool enclosure alone could make the property more appealing in the eyes of potential buyers. The addition of an enclosure increases the security of a backyard swimming pool. As most neighborhood residents with swimming pools have learned, a pool can make you the envy of your neighborhood. For children and teenagers who live nearby, the pool could be a source of temptation during times of day when your house is empty. With an enclosure, neighborhood kids will be dissuaded from jumping your fence in hopes of accessing the pool. An enclosure can also make the pool area safer for the younger members of your household. During hours when you’re unable to monitor the pool area, the door to the enclosure can be locked to prevent little ones from entering unaccompanied. You can even set an alarm inside the enclosure that will sound off whenever an unauthorized attempt is made to access the pool area. In an open–sky pool setting, a person can receive dangerous amounts of UV exposure during 30 to 60–minute swimming sessions on a summer afternoon. With the addition of a glass or polycarbonate enclosure over the pool area, you can still enjoy the natural sunlight but without the harmful UV rays. At the same time, an enclosure allows you to air condition the pool area when outdoor temperatures are hot. No longer will you need to apply sun block before hitting the pool area because the whole experience will now be cooler and free of sunburn risks. With the addition of a pool on your property, insurance premiums generally increase. When you add an enclosure around the pool, it lessens the risk for your insurance. As such, the addition of a pool enclosure can sometimes result in a reduction in your insurance premiums. In a sense, your investment in a pool enclosure could pay itself back over the course of your occupancy of a given property since premiums will likely be lower than if you had a pool without an enclosure. One of the greatest benefits of a pool enclosure is the expanded times of year that the structure allows you to comfortably swim. For example, if you live in a fluctuating climate, but your pool is situated in the backyard with no enclosure, your use of the pool might be confined to the months between mid–spring and early fall. With the addition of a pool enclosure, you can use the pool year-round. Even in winter months when rain pours and temperatures drop below 40 degrees, you could be enjoying your pool thanks to the solid roof and insulation that an enclosure provides. Get more out of your investment with a longer swimming season. With a CCSI polycarbonate pool enclosure, the PH balance in the pool water will be safeguarded from harmful UV radiation. This, in turn, reduces the money you spend on chemical maintenance costs. Over time, this helps offset some of the cost of the pool enclosure. With a pool enclosure, you can go easy on the heating system within the pool and simply rely on the insulating qualities of the structure. This way, you save on your energy bills and enjoy the pool for longer periods each year. When outside weather gets cold, the HVAC system can simply be activated on an as–needed basis. Eventually, the savings can help make back some of the pool enclosure’s cost. 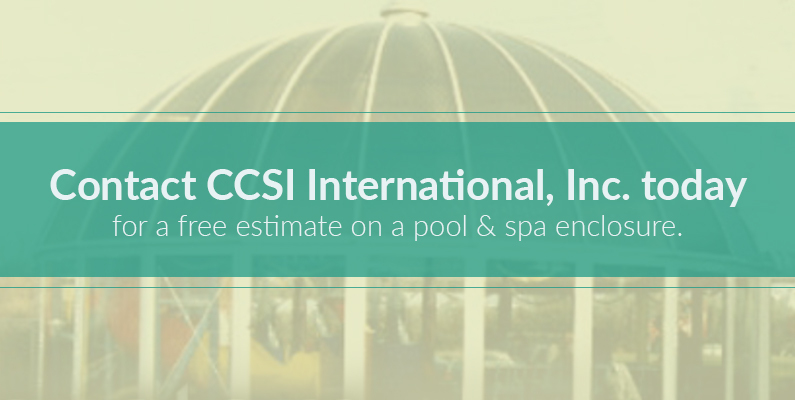 Contact CCSI International, Inc. today for a free estimate on a pool and spa enclosure. We can take a look at your pool and offer options depending on your home’s aesthetic, your family’s swimming habits and your future goals for your pool. Our team has been in the business of pool enclosures for over 50 years — trust us to ensure you get the pool enclosure that best suits your needs.